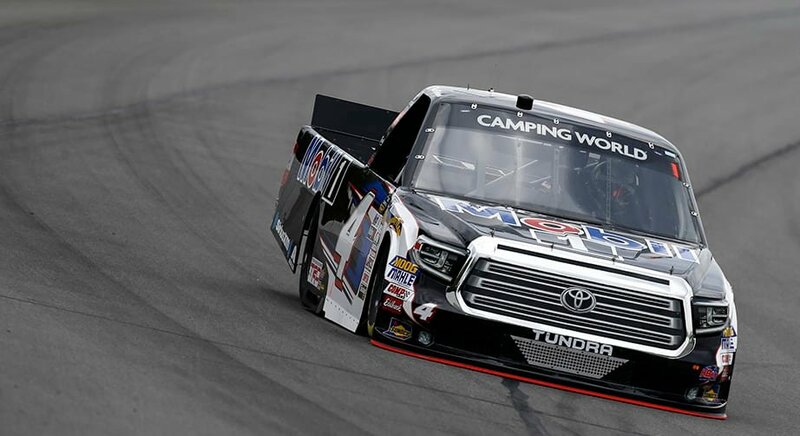 Noah Gragson has been pulled from the seat as he was not cleared by the medical team. Gragson has been fighting stomach issues all weekend at Pocono. MENCS driver Erik Jones will be the replacement driver. Kyle Busch and Todd Gilliland will lead the field to the start. 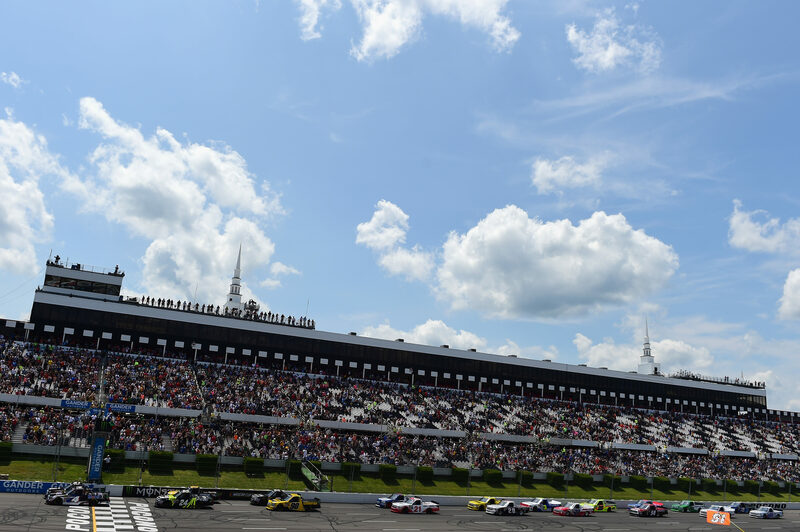 15 laps in stage 1, 15 more in stage 2 and 30 laps in stage 3 will complete the brief 60 lap race at Pocono Raceway. Kyle Busch has selected the outside line. Green, Gilliland gets the jump as Busch struggles to get through the gearbox. Gilliland leads on the inside into turn 1 as Busch falls to 3rd on the outside. Busch quickly works around Haley for 2nd. Busch has a run on Gilliland down the back stretch. He looks to the inside of the leader. Busch takes the top spot. Gilliland attempts to cross him but bails on that idea. Erik Jones has cracked the top 20 after starting at the tail. It’s only 2 laps into the race. Lap 7, Erik Jones has cracked the top 10. Kyle Busch leads Todd Gilliland by 1.4 seconds. 4 to go in stage 1, Kyle Busch hits the pit lane. He tosses the lead to Gilliland. Brett Moffitt has engine issues as he heads to the garage. 1 to go, Justin Haley is all over Todd Gilliland for a stage 1. Haley has a look to the inside in turn 3, he bails. Gilliland blocks down the front stretch as he takes the win in stage 1. The field hits the pit lane. Haley is first off with two new tires. Gilliland is off second, he took two new tires as well. Kyle Busch who short pitted at the end of stage 1 will lead them to the green. Myatt Snider will start alongside Busch. Haley restarts in 4th. Green, Kyle Busch leads into turn 1. Erik Jones has climbed to 3rd. He’s looking for 2nd down the front stretch. Jones side drafts Gilliland and pulls away from his door heading into turn 1. Erik Jones to 2nd. 4 to go in stage 2, Erik Jones has a run on Kyle Busch out of turn 1. He looks to the inside in the tunnel turn. Erik Jones leads out of turn 2. Justin Haley hits the pit lane. 3 to go, Erik Jones and Kyle Busch hit the pit lane. Erik Jones gets to the pit exit first. 1 to go, Stewart Friesen has been handed the lead at Pocono. 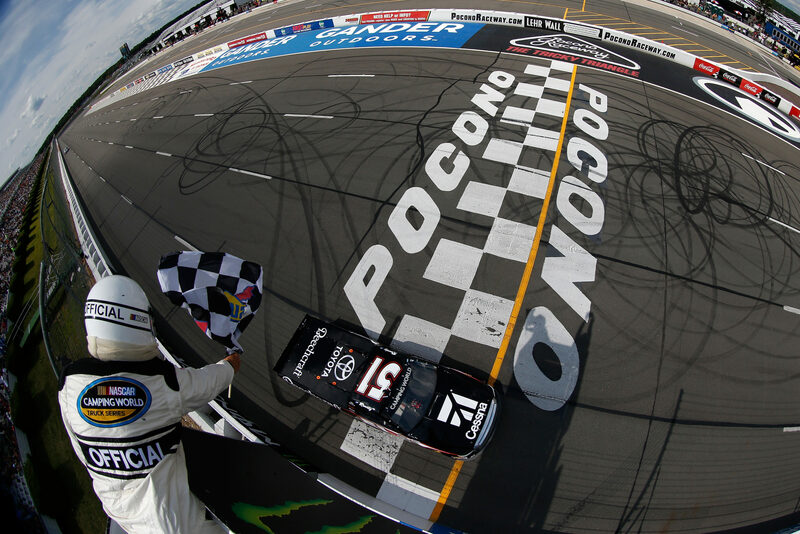 He wins stage 2 at Pocono Raceway! The trucks that didn’t pit in stage 2 hit the pit area. Dalton Sargeant took two tires at the end of stage 2 and fuel only for Joe Nemechek, they will lead the field to the restart. Erik Jones and Kyle Busch restart 3rd and 4th. Green flag, Sargeant leads into turn 1. They fan out at the back as Gilliland skated up the hill and tagged Friesen in the left rear. Friesen gathers it back up as he has a run on Haley down the front stretch. Haley pulls all the way to the apron to block Friesen but he loses the position anyway. Kyle Busch is all over the back bumper of Sargeant heading into turn 1. Busch leads off turn 1. He pulls Nemechek with him as Nemechek looks to the inside of Busch into turn 2. Nemechek lifts and Erik Jones slips by, Sargeant holds 2nd. 15 to go, Erik Jones has climbed to 2nd. He’s chasing down the leader of Kyle Busch. The gap is now 1.4 seconds to the leader. 10 to go, the gap is now 0.6 seconds. Lap traffic sits ahead of the leaders. 9 to go, Kyle Busch goes to the outside of a lap truck in turn 1. Erik Jones gets a run off the corner. Jones heads to the inside in turn 2. Kyle Busch hangs onto his right rear through the corner. Kyle Busch has more momentum on the outside heading into turn 3. Busch holds him off at the exit of turn 3. 5 to go, Kyle Busch has opened the gap back up to Erik Jones. Busch leads by just under a second. 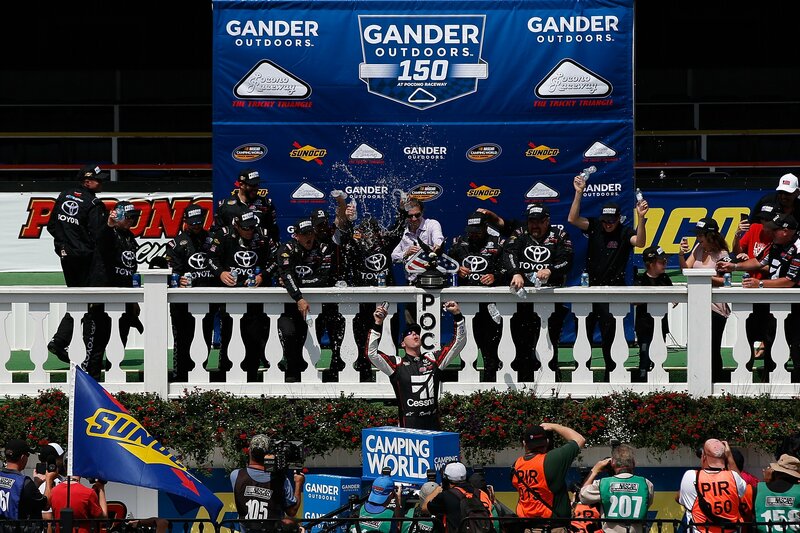 Kyle Busch holds him off to win the NASCAR Truck Series race at Pocono Raceway! It’s his 51st win in the truck series. That ties the all-time truck series win record. Busch and Ron Hornaday are now tied at the top of the record books. 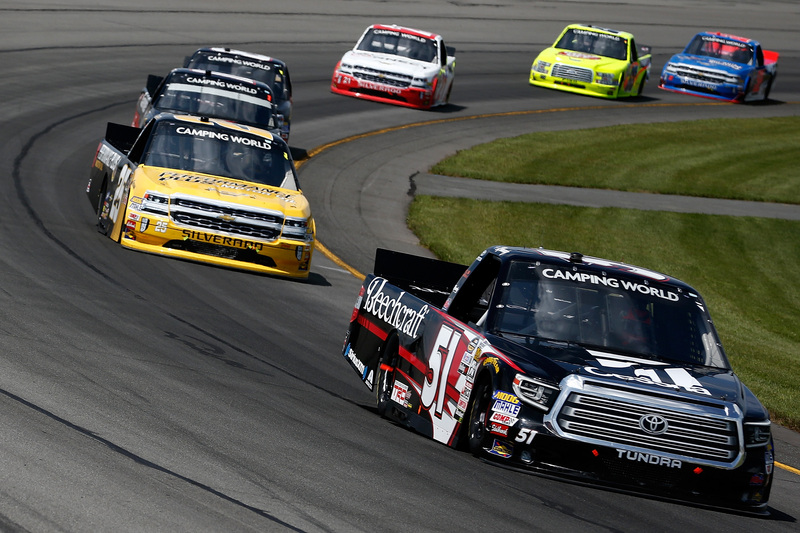 View full NASCAR Truck Series race results from Pocono Raceway below.